While fat usually gets a bad rap, a new study suggests that fat may be critical to wound healing. The team announcing the discovery included Anna Franz, Will Wood, Paul Martin with the Queen’s Medical Research Institute at the University of Edinburgh in Scotland. The three scientists watched fat cells, which were previously thought to be immobile, propel themselves toward wounds with a wormlike motion. The University of Edinburgh team labeled the fat cells of fruit fly pupae with a fluorescent dye and then used a laser to make a small wound in the developing fly larva. Within an hour, the fat cells had swum toward the injury. The three researchers published their results on Feb 26, 2018, in the journal Developmental Cell. Video of fat cells migrating to a wound courtesy of Science. Youtube link to the video. The researchers say that that cells likely play a similar role in healing the wounds of humans too. The fat cells of the fruit fly are equivalent to those of humans and other vertebrates, though it remains to be seen if we follow the exact same process. The scientists discovered that immune cells called macrophages showed up at the wound first. 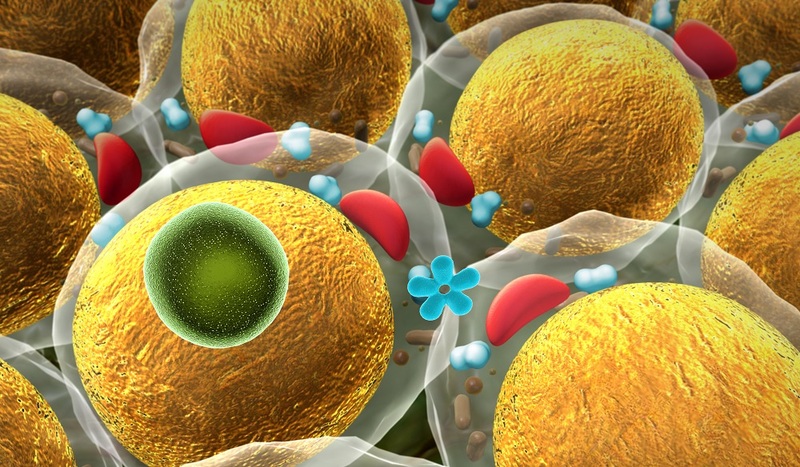 The fat cells arrived shortly after that and brushed the immune cells aside. The researchers found a protein called actomyosin is responsible for the fat cells’ wormlike propulsion. The fat cells continued to show up at the injury even when the scientists deactivated the immune cells, indicating that macrophages aren’t signaling the location of the wound. Both types of cells worked together to heal the wound. The fat cells crowded into the wound and pushed the cellular debris to edges where the immune cells could consume the waste. The fat cells tightly plugged the injury until new tissue could grow and released antimicrobial compounds at the infected wounds. The fat cells stayed at the wound site until it was healed. “Then they detach and just swim off, as though their job is done,” says Martin. Advancements in microscopy techniques are enabling researchers to uncover more of the cell’s hidden secrets. Recently, another group of scientists used a new type of microscope to catch the molecule triggers inflammation in autoimmune diseases. The researchers filmed mitochondrial DNA escaping during cell death, for the first time. This discovery is not just a scientific curiosity because rogue mitochondrial DNA contributes to the chronic inflammation that plays a role in autoimmune diseases. Cover Photo: Ugreen / Getty Images. Kimberly Hickok. “Watch a wound close with the help of fat cells.” Science. ScienceShots. Feb. 26, 2018.